The work as we have it was collected over many centuries by various authors, translators and scholars across the Middle East and North Africa. The tales themselves trace their roots back to ancient and medieval Arabic, Persian, Indian, Egyptian and Mesopotamian folklore and literature. In particular, many tales were originally folk stories from the Caliphate era, while others, especially the frame story, are most probably drawn from the Pahlavi Persian work Hazār Afsān which in turn relied partly on Indian elements. A good man had a beautiful wife, whom he loved passionately, and never left if possible. One day, when he was obliged by important business to go away from her, he went to a place where all kinds of birds are sold and bought a parrot. This parrot not only spoke well, but it had the gift of telling all that had been done before it. He brought it home in a cage, and asked his wife to put it in her room, and take great care of it while he was away. Then he departed. On his return he asked the parrot what had happened during his absence, and the parrot told him some things which made him scold his wife. 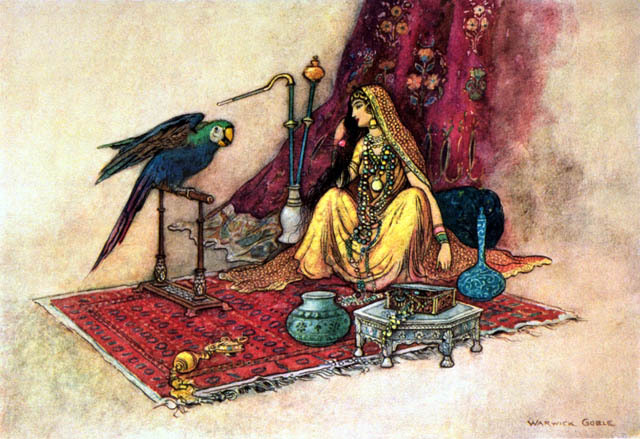 She thought that one of her slaves must have been telling tales of her, but they told her it was the parrot, and she resolved to revenge herself on him. When her husband next went away for one day, she told on slave to turn under the bird's cage a hand-mill; another to throw water down from above the cage, and a third to take a mirror and turn it in front of its eyes, from left to right by the light of a candle. The slaves did this for part of the night, and did it very well. The next day when the husband came back he asked the parrot what he had seen. The bird replied, "My good master, the lightning, thunder and rain disturbed me so much all night long, that I cannot tell you what I have suffered." The husband, who knew that it had neither rained nor thundered in the night, was convinced that the parrot was not speaking the truth, so he took him out of the cage and threw him so roughly on the ground that he killed him. Nevertheless he was sorry afterwards, for he found that the parrot had spoken the truth.